I'm shocked and delighted that these shrub roses in my garden are doing as well as they are doing, in spite of the lack of any real rain since May 1st. As I embarked on my drought recovery program, I spent some time assessing my garden over the weekend. 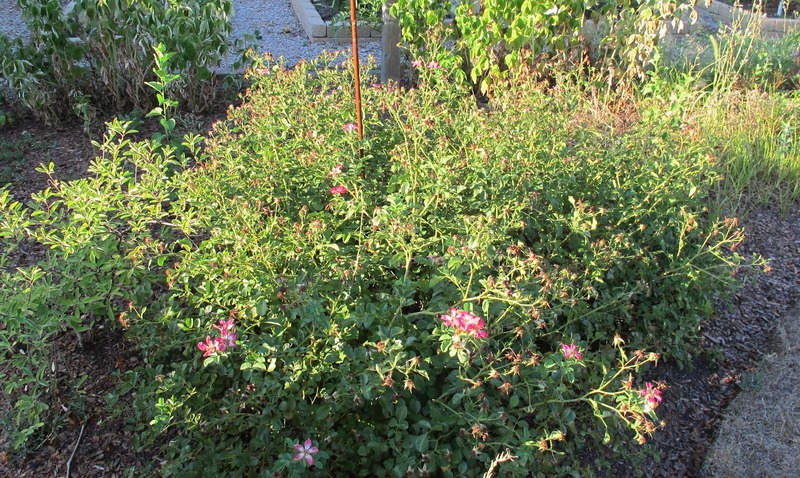 When I got to this section of the garden, I wrote "shrub roses look pretty good but have some weeds nearby ready to encroach on their territory", or something like that. Notice that I didn't write "pull those weeds before they take over those shrub roses and stop whining about the heat", or something like that. 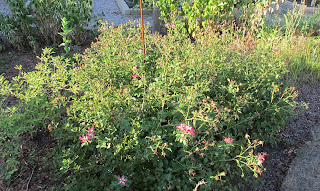 Nor did I write, "wow, plant more shrub roses because they seem to be able to grow in spite of the drought". That's because the previous step on the road to drought recovery was "assess your garden", not create a task list. But now that I have an assessment of the garden and have previously thought of the goals for my garden, it's time to move on to the next step, making a quick hit task list. Finally! Now we are getting somewhere. For awhile it looked like drought recovery was all about list making. Well, technically it is still about list making but now it is about making a quick hit task list. To make your task list, go down through the assessment and list off the stuff you should do no matter what the goals are for your garden. In most cases, it will be to weed. My weeding list goes something like this: weed around the roses (pocket full of posies), weed the half of the vegetable garden you didn't weed last week, weed in Plopper's Field, weed in Woodland Follies, weed, weed, weed. Oh, and emergency watering will most likely be on your list, too, plus tasks like adding some mulch in a few bare spots and moving some leftover edging blocks over next to the compost bins and stacking them neatly. Etc. What should not be on your quick hit task list is any kind of planting, designing, reconfiguring, repurposing or re-doing of any part of the garden. Patience. There will be time for that once the quick hit task list is done. Still with me. Still recovering from drought? Still in love with gardening? At this point in your drought recovery, if you are following along with me, you have some goals, you have an assessment of your garden, and you have a quick hit task list. I don't know about you, but having all this gives me some sense that I am now back in control of the garden* no matter when it rains again. With that sense, I'm ready to check those quick hit tasks off one at a time so I can get on to the next step in drought recovery. *This statement should not imply that I ever lost control of my garden in the drought, in spite of evidence to the contrary like weeds, sloppy piles of left-over edging or plants that need water now. Weeding, weeding, and more weeding seems to be at the top of my quick hit list, too. I'm beginning to think there's a lesson here--the weeds seem to be impervious to this drought, while my flowers are suffering. I would never think you had lost control of your garden, Carol! weeding and putting hoops of chicken-wire over plants under the huge Wild Cherry Tree so our free-range chickens don't dig up my ferns, dwarf crested iris, Wild Columbine, etc. while scratching for the falling cherries. Hi Carol. Drought has taken its toll a bit here as well. On another note...I am nominating you for the One Lovely Blog award! I follow your blog regularly and feel it is wonderful and LOVELY so Congratulations-I am passing the award along to you! The rules to accepting this wonderful award are on my site at http://landscapedesignbylee.blogspot.com. If you feel you cannot comply with the rules of the award please accept this nomination in the sincere spirit in which it is offered. Drought sure is a pain, isn't it - hope that rain comes soon to all who need it! Years ago I heard that it can be better to cut off weeds at soil level in drought rather than digging them, since there is less soil exposure. (Can't remember where I heard it but the subject was most likely flower beds rather than vegetable plots. Once removed, the weeds may grow back, but a few sharp cuts can at least discourage them until it's cooler. There's something I can do with my enforced down time: make some notes on what needs doing in the garden. I'll have to work from memory since I can't wander around assessing!